I’ve written out a pretty detailed overview of ‘What is Extreme Couponing?’ a few months ago, but wanted to elaborate more on the subject since I am continuously learning myself. I suggest you take a look at the original post first and then read below for the updates. Binder set up: I’ve made changes since my first upload. 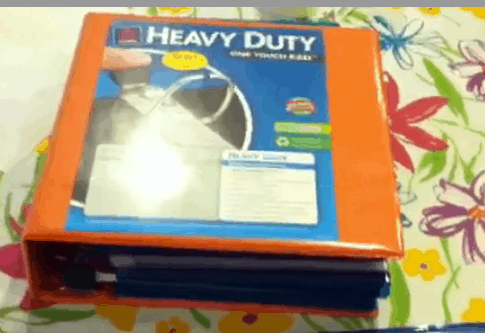 So watch the video to see how my ‘Extreme Couponing’ binder is put together. Scenario 1: You have 2 $1 off coupons: Apply them both! Let’s say something is Buy 1 Get 1 Free at CVS. You can bring 2 $1 off coupons and apply those savings to the entire order. The store will take the coupon for the item that is free! So, not only is it free – but they are GIVING you a dollar (or whatever the value is of the coupon) to buy it. MAGIC! Scenario 2: (you better sit down for this one because this is the best ‘Extreme Couponing’ tip I’ve ever come across. When an item is Buy 1 Get 1 Free AND you have a Buy 1 Get 1 free coupon …. you can combine them and get BOTH ITEMS FOR FREE. DID YOU READ THAT? CAN YOU STAND IT? All this time I didn’t know that! For example, this week there are Air Wick Air Fresheners on sale – Buy 1 Get 1 Free PLUS I have 3 coupons that are Buy 1 Get 1 Free in my binder because I save everything. Well, today I am heading over to Rite Aid to pick up 6 FREE air fresheners. Extreme Couponing is like stealing… only it isn’t. LOL! Typically, I get up on Sunday around 6:30 or so (thanks to my kids). I walk out, get the paper and then for the next hour I do the circulars. I then hit up the stores before 7:30 and ALWAYS come home with whatever I planned for. Well, this week I didn’t have the chance to get there Sunday morning because I took the kids to go see a show at Radio City and went yesterday afternoon. There was NOTHING IN THE STORE. Out of the 6 deals I had written down – I got ONE. I was almost fighting with the manager – MANIC. “WHERE ARE YOUR PRODUCTS?? ?” Oh we ran out. Apparently, the stores don’t stock up to cater to all the customers. It’s sort of a first come first serve deal. Yes, you can get rain checks – but I rather just get what I came to get and not worry about forgetting to pick it all up. So – if you are serious about doing this be sure to go Sunday morning – EARLY. Once a week I get some amazing coupon sent to me via email. It’s either $5 off of $30 OR 25% off your entire order – etc. Whatever it is, it’s WORTH handing over my email address. It’s just one extra thing to add to your bag of tricks. Do you have any extreme couponing tips you’d like to share? Would love to hear!! Great tips! I didn’t think I could use identical coupons when items are BOGO, but guess what…now that I know I can, I will be gettings tons of free stuff! That’s awesome! Thank you. Re: organizing coupons, when I pull them out of my labeled accordian file, I put all “like” items together and put them in order by aisle. That way, I can get to them super fast. As I put the item in the cart, the coupon goes into the “use” section of my mini coupon wallet. If they don’t have the product, it goes into the “later” section.